Veranda 2 Glass Bottle The glass may be empty now but it's "full" of promotional possibilities.The Veranda 20 oz. clear glass bottle offers a unique spin on a classic beverage accessory. 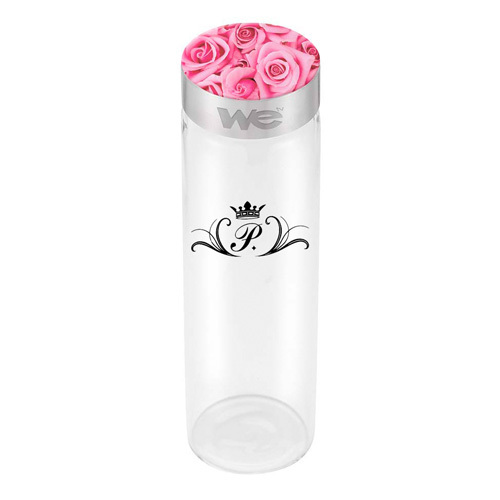 If you're looking for a gift that's outside the norm then have your company name or logo imprinted on these cylindrical holders and add them to your incentive program collection. Great for restaurants, wellness events, corporate luncheons and college bookstores! This item is diswasher safe. Gift Box / 22 lbs / 24 pcs. / 12" x 9" x 10"box.